If you take Paul Rahn’s class in Chicago, you can be sure there’s never going to be a dull moment. At his gym, SWEAT, his class programs make you work right from minute 1 all the way to minute 60 – and that’s exactly how he’s planned his classes on the SweatWorking App, too. Good news for you if you live anywhere outside of Chicago, you can experience Paul’s workout on the app totally free. All you have to do is download SweatWorking here and you’ll be directed straight to Paul’s Total Body HIIT. What’s in store for you if you take on Total Body HIIT with Paul Rahn? Expect four different four-minute circuits that you’ll repeat for four rounds. You’ll have bodyweight cardio, dumbbell strength exercises, and bosu ball core work that your abs are going to remember for days after your workout. Remember, when you hit play on a SweatWorking workout, you can turn up your own tunes no matter where you are and either listen or watch Paul for cues on your movements. We’ve got you covered on timing, so all you need to do is focus on your form and making the most of the time you’ve carved out for yourself. 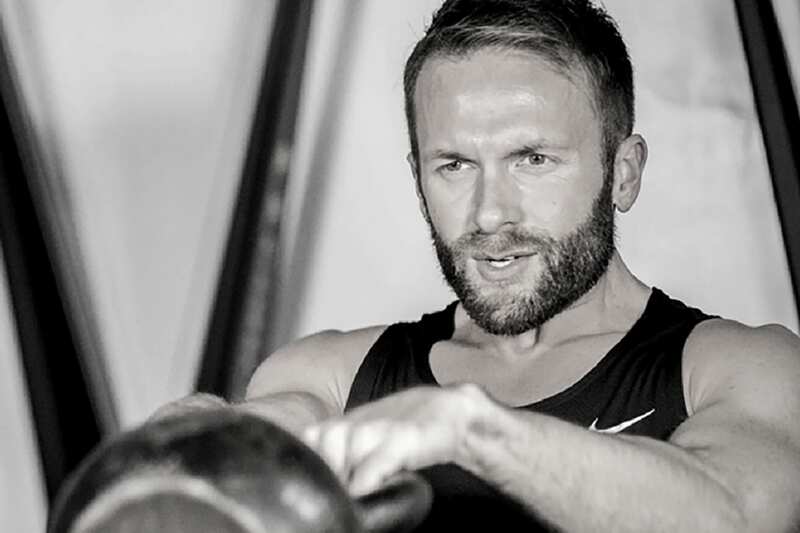 And if Paul’s fun, upbeat style of workouts isn’t enough to help you smile through the pain and keep going, here’s a few things you might not know about one of our newest SweatWorking coaches to the team. In a nutshell, what’s your teaching style? I am straight forward, I like to pretend I can be sing on the mic, love to get next to you and push you past your comfort zone, and making sure you rock the best technique is my jam! What do you love most about teaching? I love teaching people how to push themselves, and I love when I get to watch people come back and make real changes in their bodies. Watching their faces, their confidence improve as they achieve their goals is the BEST! Your best advice to anyone who takes your class – in real life or on the SweatWorking app? Set yourself up for success mentally. You know it’s going to be a challenge but just accept it and know I am here as a tool for you to improve your body, mind, and life. Anywhere in the world you could travel to right now? Bali – Eat, Pray, Love-style. Download SweatWorking and try Paul’s workout here!